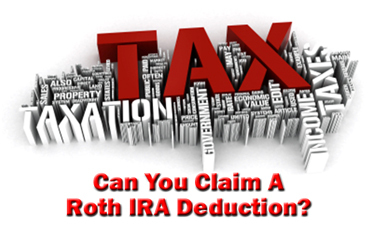 Can you claim a Roth IRA deduction on your tax return? As a general rule, Roth IRA contributions are not tax deductible. If you qualify, you can claim a deduction on your tax return for certain costs associated with your Roth IRA. Other than these special circumstances, it's highly unlikely you can claim a Roth IRA deduction on your tax return. And remember, while you can deduct Roth IRA contributions from your paycheck, this is not the same as making tax deductible Roth IRA contributions. A Roth IRA can only be funded with after-tax money. Unlike a Traditional IRA or a 401k, you can NOT claim a Roth IRA deduction for your annual contributions. This means your Roth IRA contributions must be made with after-tax dollars, essentially your take home pay after you pay income taxes. There are advantages and disadvantages to this rule, but just remember, if you make regular deductions from your paycheck to fund your Roth IRA, those contributions do not lower your taxable income. You must pay income taxes on those contributions, even if they never see the inside of your bank account before routing to your Roth IRA. When you file your tax return, you're free to take a deduction for contributions to a Traditional IRA, a 401k, a 403b, or various other retirement accounts, but you can never take a Roth IRA deduction for regular taxable Roth contributions. The obvious disadvantage in your inability to claim your contributions as a Roth IRA deduction is your inability to lower your taxable income. With a Traditional IRA, your contributions are tax deductible. So you lower your taxable income and save some money on your current tax bill. Let's say you earn $50,000 per year, and you pay 30% of your income in taxes. In such a scenario, you pay $15,000 in taxes and have $35,000 in after-tax income leftover. So if you make a non-deductible Roth IRA contribution of $5,000, you're left with $30,000 in take home pay. Now, let's say you run the same scenario, but this time you contribute to a tax deductible Traditional IRA. In this case, you make a $5,000 contribution and deduct the contribution amount from your taxable income of $50,000. You now, after contributing to your Traditional IRA, you have $45,000 in taxable income subject to a 30% tax rate. So your tax bill comes to $13,500 instead of the $15,000 you pay if you contribute to the non-tax deductible Roth IRA instead. As a result, you end up with $31,500 in take home pay instead of a mere $30,000 in tax home pay by contributing to a Roth IRA. But is it really an advantage to make tax deductible contributions over non-tax deductible contributions? If you look closely, you see the Roth IRA maintains a big advantage over a Traditional IRA simply because it isn't tax deductible. Because tax deductible IRA contributions may not cost you now, but they do cost you in the future. Because when you withdraw funds from a Traditional IRA after age 59 ½, you generate an income tax liability. But when you withdraw funds from a Roth IRA after age 59 ½, you don't generate a single dime worth of tax liability. So while you might save $1,500 in taxes by maxing out your Traditional IRA instead of your Roth IRA, you end up with less money in retirement. You make $50,000 per year and pay a 30% tax rate. A $5,000 Traditional IRA contribution leaves you with $31,500 after taxes. But a $5,000 Roth IRA contribution leaves you with only $30,000 after taxes. Obviously, the Traditional IRA is the better deal, right? Assuming both accounts grow 8% annually for 20 years, how much money do you have? You end up with $23,304.78 in each account. Withdrawals from your Roth IRA are tax-free, while withdrawals from your Traditional IRA are subject to income taxes. You really end up with $23,304.78 in your Roth IRA, but only $16,313.35 in your Traditional IRA. That's a difference of $6,991.43 just so you can save $1,500 on this year's tax bill. But wait, you say... That's misleading because the $1,500 invested over 20 years can make up the difference. If that's the case, and you plan on investing the $1,500, why invest it in anything other than a tax-free Roth IRA? You end up with a lot more money in the end! Not to mention that the aforementioned scenario assumes your tax rate stays at 30%. With trillions of dollars in national debt, do you really think it will go down? Odds are, it's going up. Aren't you better off with your Roth IRA? So do you see now why a Roth IRA deduction isn't such a big deal? You're better off avoiding taxes in retirement rather than avoiding them today. After you've finally soaked in the fact that Roth IRA contributions are NOT tax deductible, I'm going to contradict myself and point out how you can deduct some of your Roth IRA contributions! It's still true you can't deduct your Roth IRA contributions, but... in certain cases, you can get a tax credit for making a Roth IRA contribution. And in the end, doesn't that serve the same purpose as taking a deduction? As long as you meet the IRS qualifications, you can take a Roth IRA tax credit for up to 50% of contributions. So what if you don't qualify for the Roth IRA tax credit? Can you get any sort of Roth IRA deduction? In certain cases, you can take a Roth IRA deduction on the losses you incur as a result of an underperforming investment portfolio. However, before you do so, you must make certain you follow the rules for doing so. 1) Close Your Roth IRA - You must close out your Roth IRA. This includes every financial account designated with the "Roth IRA" label into which you've made Roth IRA contributions. It also includes any Roth conversions of a Traditional IRA. Remember, you only have one Roth IRA. You may have multiple Roth IRA accounts with various financial institutions, but in the eyes of the IRS, all of those accounts are a single Roth IRA. So "close your Roth IRA" means every single account, not just a particular account you've hand picked. 2) Itemize Your Tax Return - In order to claim a deduction for Roth IRA losses, you must itemize your tax return. If you don't itemize, you won't be able to take advantage of the deduction, even if you meet the other requirements for claiming a loss. 3) Take a Deduction on Only Those Losses in Excess of 2% of AGI - You can't take a deduction for your total Roth IRA losses, only those losses exceeding 2% of your Adjustable Gross Income (AGI). So if you calculate your losses, and they don't exceed 2% of your AGI, then you probably won't benefit from the claiming Roth IRA losses. 4) Make Sure Don't Owe Alternative Minimum Tax (AMT) - You also can?t claim a deduction for Roth IRA losses if you're subject to the Alternative Minimum Tax. So consult your accountant or tax attorney to make sure aren't subject to the AMT before attempting to claim a deduction for Roth IRA losses. If you meet these four requirements, and you believe you can claim a Roth IRA deduction for your Roth losses, visit Can You Claim a Tax Loss on Roth IRA Losses? to learn more details about taking advantage of this special circumstance. As a general rule, you can't claim a Roth IRA deduction for your Roth IRA contributions. Roth IRA contributions are non-tax deductible and must be made with after-tax take home pay. However, if you meet certain IRS requirements, you may qualify for a Roth IRA tax credit which essentially serves the same purpose as a tax deductible Roth IRA contribution. You may also be eligible to claim a tax deduction for investment losses you incurred within your Roth IRA. However, to do so, you must close your Roth IRA and meet several additional requirements. In the end, regardless of whether or not you're able to claim a deduction or a tax credit, investing in a Roth IRA over a Traditional IRA, 401k, or other tax deductible retirement account can offer you tremendous advantages. Your money grows in your account tax-free for as long as you wish, and after you reach age 59 ½, you can withdraw funds tax-free and penalty-free. And that more than offsets the absence of a Roth IRA deduction in the short term! Return to the top of Can You Claim a Roth IRA Deduction?